Mix jerk marinade, olive oil and lime juice in a shallow bowl. Add pork chops, turning over to coat. Cover with plastic wrap and refrigerate for at least 2 hours. Meanwhile, make salsa. Combine olive oil, honey and vinegar in a bowl and mix well. Stir in remaining ingredients and set aside, or refrigerate for up to 12 hours. Rub or brush grate with a little vegetable oil and preheat grill to medium-high. Remove chops from marinade, season with salt and pepper, and grill for 7 to 8 min. Turn over and grill 6 to 7 min. longer or until pork reaches 160°F(71°C) on an instant-read thermometer. 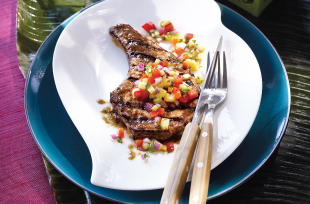 Season salsa with salt and pepper to taste while allowing chops to rest a few minutes, and serve.